Here is a resource for information on mortgage rate trends. Bankrate.com provides a tool for creating simple charts in a variety of types for periods of 3 months to 5 years. Sometimes it’s nice to have a simple chart, and there are so many situations in which this could come in handy. There has suddenly been a lot of talk in the media about how, based upon December numbers, the housing market is faltering – and there’s talk of a “double-dip” and so on. Honestly, I have no idea what the future holds, but drawing big conclusions from 1 month’s data is nonsensical. 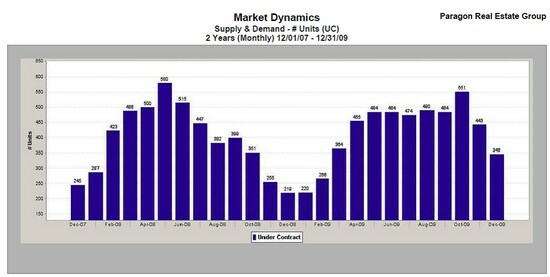 In any case, here is a chart of SF listings going under contract. December’s ratifications did fall from the autumn, as they always do, but comparing the numbers to not only last year (crash) but to 2007, we see that December 2009 was not particularly weak, at least not here in SF. Click here to examine the PDF of the full report. Although the primary purpose of the San Francisco Association of REALTORS® is to offer business services and legislative representation to REALTORS® in San Francisco and surrounding areas, it also provides a variety of information services to the public to strengthen the connection between REALTORS® and consumers. Those services are described below. The data below is from sources deemed reliable but may contain errors or omissions, and is not warranted. Sales not reported to MLS (such as many new-development condo sales) are not reflected in these statistics. Median prices may fluctuate for other reasons besides changes in value. Depending on neighborhood, SF home values peaked in 2006, 2007 or 2008, then declined dramatically in the 2nd half of 2008 (especially after 9/15/08), and then recovered (somewhat) with the surge in sales that began in spring of 2009. The increase in TIC median price in the 4th quarter of 2008 and the 1st quarter of 2009 is an anomaly: very few sales occurred and they do not reflect the reality that TIC values also fell during this period. (A good example of how median prices can fluctuate.) The main point of the chart is the stability of house and condo median prices in the 2nd and 3rd quarters of 2009, and the uptick seen in the 4th quarter. It is too soon to reach definitive conclusions, but it appears that buyer demand is fueling a small increase in values.